Now that I have my own house I don't have to worry about bothering my mom's things but let's be honest, it's a lot of work to redecorate regularly. In spite of the extra work to take trinkets out of storage while tripping over toys or dusting shelves with one hand because the other is holding a baby on my hip, it feels so good to give pieces new life and freshen up an arrangement. 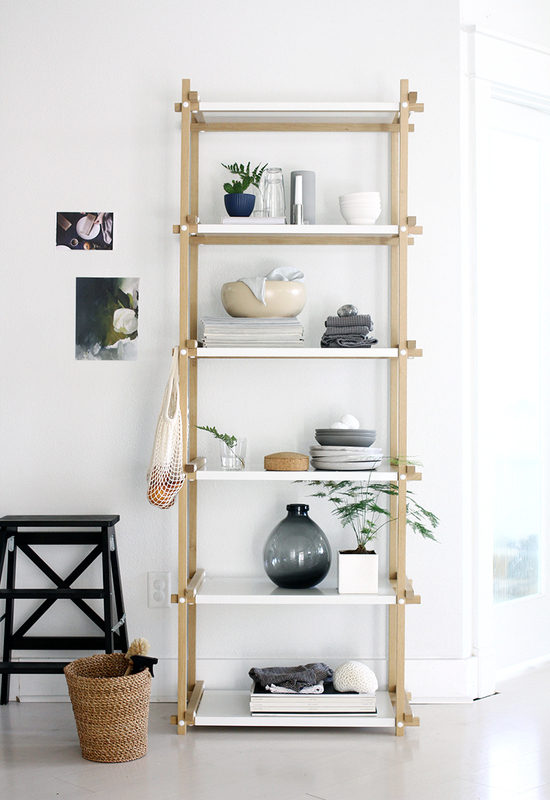 I've collaborated with Target Style to show you how I take some of their newest home collection pieces and style my favorite bookshelf to give it a fresher update. It's amazing how curating open shelves can make a space feel brand new and it doesn't take much, Target makes it soooo easy! 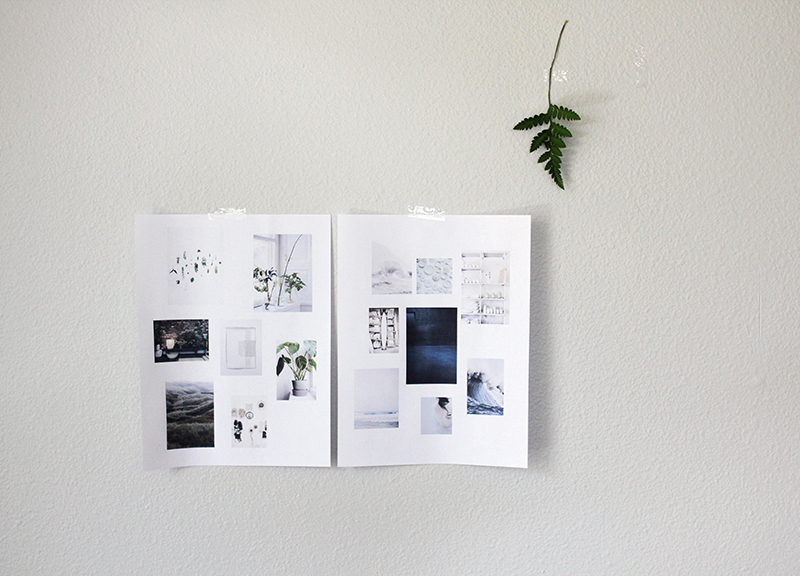 One thing you can do, if you have the time, is make a collage or moodboard. Rip photos from magazines, even some of those much older issues or copy pages out of a photography book. You can print images from the web (for collage purposes only) or do what I did, throw some images I liked together on a couple printer pages in Photoshop, just enough to stand back and see what works together/doesn't and get a general idea of the look I'm going for. I used fresh green accents, with Spring now here it's a must. 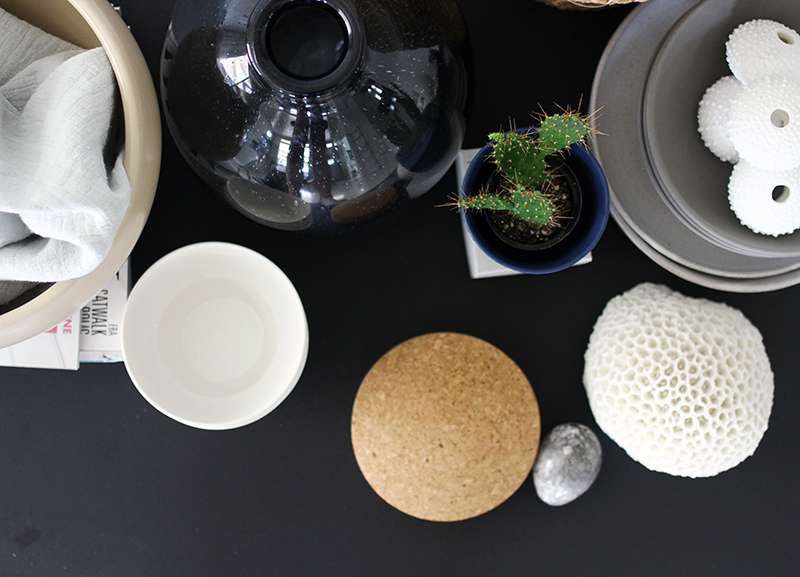 The newest collection from Target has a lot of nautical pieces which is great because I love these brain corals and porcelain urchins with porous white, sculptural textures they add. A hint of blue from a small dipping bowl that holds a cactus, some soft natural colors from cork, jute and rope. 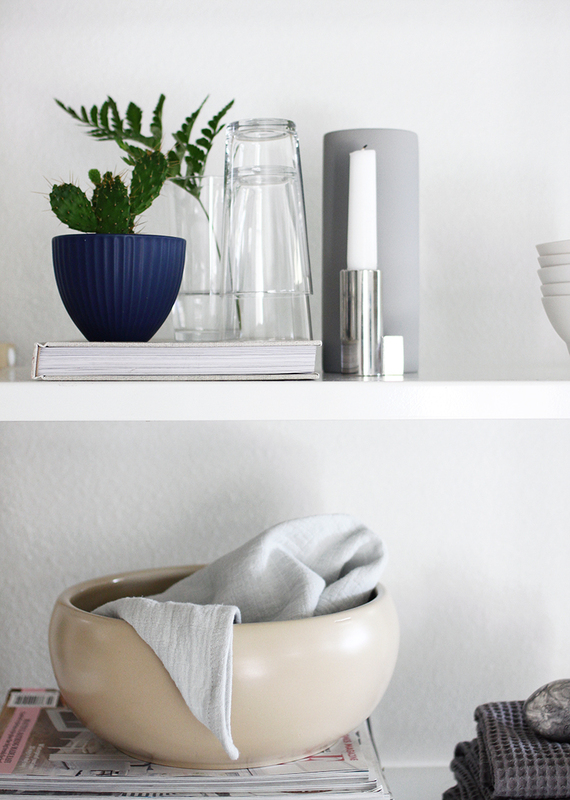 Glass is an other element that offsets these more organic surfaces, both for holding small fern stems but also this grey vase which has a subtle beach feel. Also, because this wall is adjacent to my kitchen I included stacks of plates and bowls, even towels. 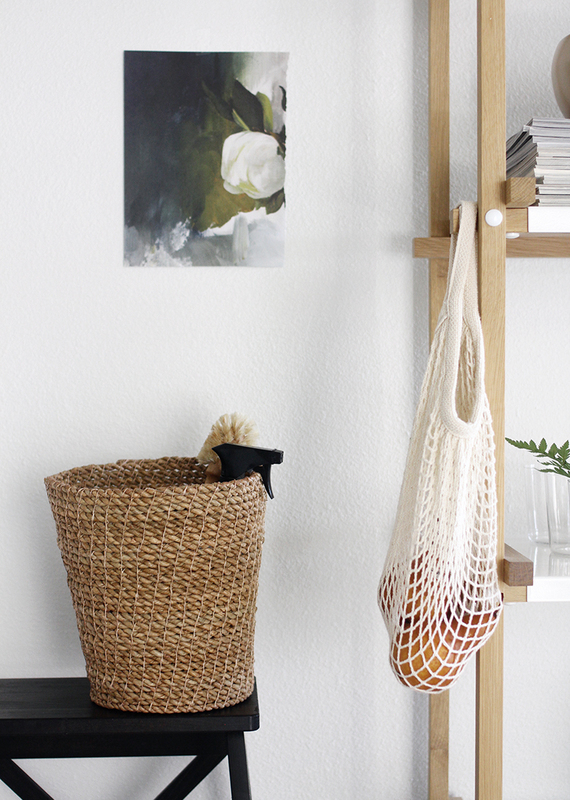 I used a basket to hold a spray bottle and a brush for cleaning. This, of course, is the fun part. Since the newness of plant life and Spring are relevant and ocean elements were an influence, I wanted the finished shelves to be airy so I purposely left pockets of blank space. 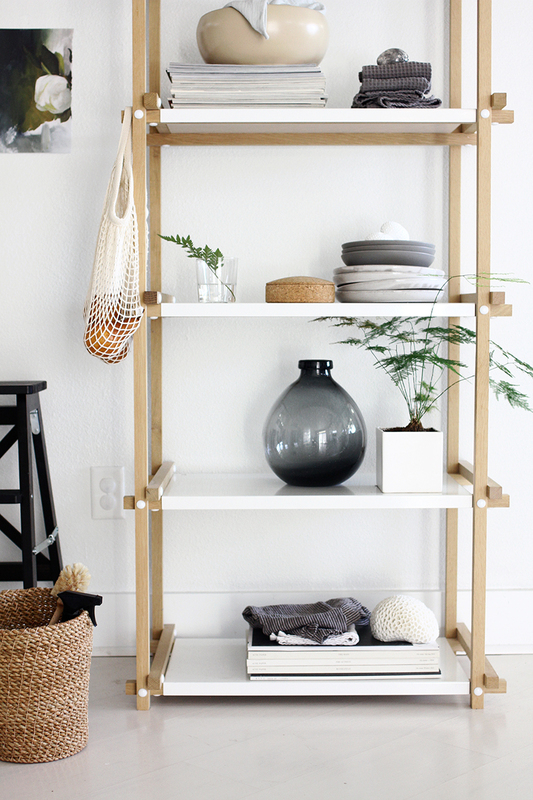 Don't feel obligated to completely pack your shelves with lots and lots of stuff. You can put everything on there from your gathering but then step back and edit yourself. Make sure to remove something(s) because a few well chosen pieces are a bolder look than too many competing pieces, things can get lost. Another piece of advice I'd offer is to add some practicality or function to your arrangement. Of course we're going for something aesthetically nice but why can't is serve to be useful as well? In my case I have magazines but also one of my favorite cookbooks, nearby enough to search for a quick recipe. Be mindful of the location of your bookshelf and how you use that general area, so something near a living room could hold extra throws and pillows, a shelf in the bedroom could hold extra bags and shoes, dishes for small jewelry...you get the idea. Love the colors represented here so much! I have been a rearranger since a young age too! It's like hitting a reset button for me and makes the whole house feel new! This is so beautiful! If I had more space in my room I'd definitely try something like this too. i love minimalistic interior! its my style!